Like blitzing down the Ballyhouras on your bike with an icy wind in your face, this delivers a refreshing crisp smack around the gills. It pours a pale golden colour and the malty sweetness is well balanced by the American Chinook, Amarillo and Centennial hops. 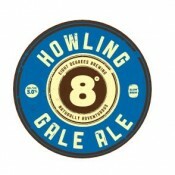 Howling Gale has a pleasant grapefruit and citrus aroma and goes well with fish, chicken or anything off the barbeque.